What initially drew me to the book was, of course, its intriguing title and colorful cover. I know, I know. You’re never supposed to judge a book by its cover. 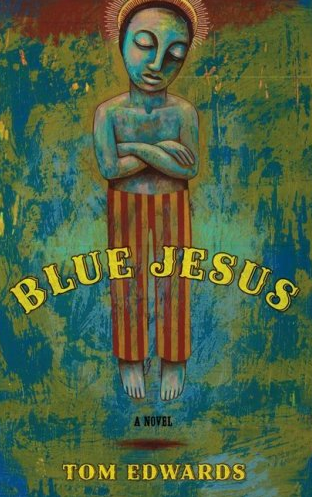 But honestly, whose curiosity wouldn’t be peaked by a book entitled Blue Jesus? Within the first ten pages, Buddy and Early find a dead baby in their small Georgia town’s dump, and if that isn’t surprising enough, Early manages to do the impossible—bring the baby back to life. And, as expected, complete chaos follows. The book gracefully deals with sensitive issues—child abuse, adolescence and its abrupt end, death and its toll on those left behind, and the existence of God are all weaved throughout the novel. Its messages are profound, but sometimes too much so. Although told through Buddy’s eyes, at times I felt I was reading the observations of someone much older. Still, the novel left me with a different perspective of the world, and that’s something all good books should strive to do. And can I just say plot twist? Totally didn’t see that ending coming, and I’m usually pretty astute about these things. I highly recommend Blue Jesus. Check it out here!